As of 22nd November 2018, the AYBA VHF Repeater Channel 27 has been changed to Channel 4. Please use Channel 4 going forth for your VHF communications. 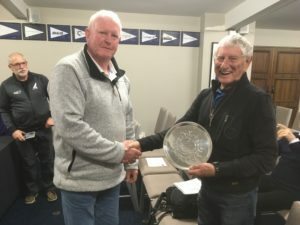 was awarded to Garth Briden for his many years of voluntary service with race management and assistance with sailing events. He is a face often seen at major regattas and is very much an integral part of the youth sailing across the country. He has always provided excellent service due to his communication skills and his keen mark laying ability, making for a great colleague to work alongside. AYBA will be opposing the proposed dolphins almost entirely on safety grounds but also on loss of amenity.Since the original harbour was at the bottom of Shortland St back in the 1800’s the harbour edge has extended 700 m in to the harbour at the end of Queen’s wharf. Panuku now propose to go almost another 100 m, exacerbating an already dangerous pinch point in the harbour at the busiest piece of waterway in NZ. Not only does considerable marine traffic pass up and down the harbour but the ferries cross the harbour to and from several different termini on the North Shore. This very situation is why various harbour masters have imposed restrictions around the ends of the wharves and in the main channel stating that they were doing it because of all the accidents and the constrictions the wharves create.It is into this scenario that Panuku propose to cause a further 100 m blockage. Panuku have been unable to provide us with any studies into how big the harbour needs to be, only justification as to how they propose to make more money from the cruise ships. When we enquired as to why they did not stick with the Council’s own Central Wharves plan, written as recently as 2015, which would see the cruise ship terminal at Captain Cook wharf we were told that the Council have not allowed any funding in the next 10 years for that and since it is owned by the Council as opposed to Panuku they have discounted that idea. It would seem that if mayor Goff was sincere when he said he would oppose any further encroachment into the harbour that all he needs to do is get the owner of Captain Cook wharf and Panuku to talk to each other.